The days are growing shorter as the dark comes earlier it seems each night. By the time I finished my craft for photos the sun had long since set! 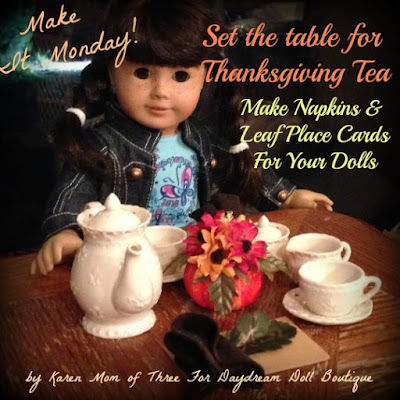 For today's Make It Monday craft I am sharing with you an easy way to add a little glam to your dolly tea table using items you may have at home. Setting a nice table makes all the difference when you are entertaining with friends and dollies are no exception. 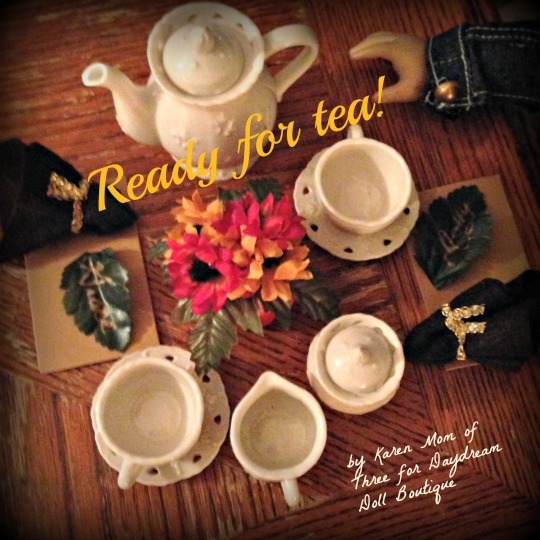 To share today I am showing you how to use fun foam, felt, ribbon, left over artificial flower leaves and a sharpie to create a festive fall themed or Thanksgiving themed tea for yourself and your dolls. Step 1- Remove the leaves from a stem of an artificial flower, pull off the small plastic part that held the leaves into place and then trim apart the leaves. Step 2- Use a Sharpie Marker to write your dolls name on the leaf. Repeat for as many dolls that you have attending the party. Step 3- To create each napkin I measured and cut a 4 inch by 4 inch square out of felt. Then I placed the felt over my finger to form the napkin shape. Next I wrapped ribbon around the center and tied it into place. Step 4- Cut out place mats for your dolls using fun foam. I cut 3 1/2 inches by 2 1/2 inch rectangles but you can make yours larger if your table has space. Now you are ready to set the table for your dolls tea party! 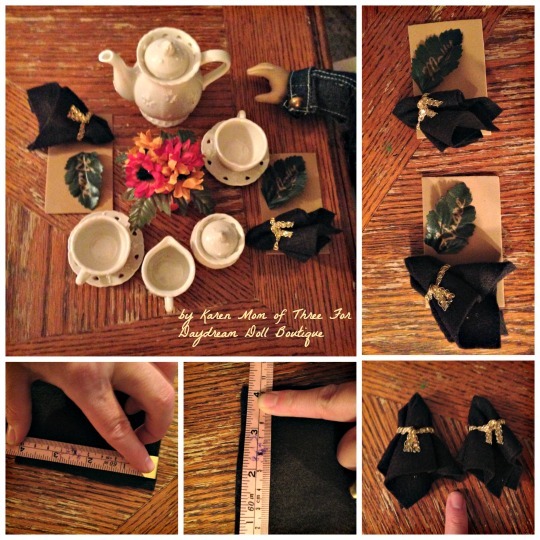 I used items I had from my own mini tea set collection to set this table and I am thrilled with how it turned out and so was my doll! Hey, this Table for Thanksgiving Tea is looking stunning. How simply and easily you decorated it. Thanks for the inspirations here. Well, I hosted thanksgiving party for my mom at some local NYC venues. Mom adored it a lot. She got so happy to have this surprise party.